Museums Swamped &#8212; by kids!! 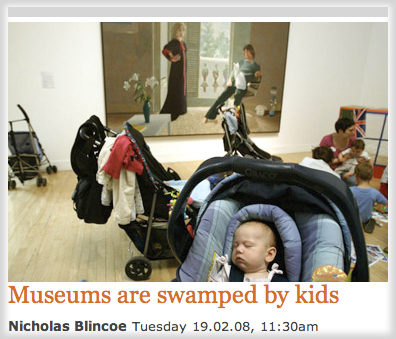 Museums Swamped — by kids!! Here’s the link to the article. What do you think? I appreciate it when museums have stuff for kids, in part because gallery activities and kid-friendly information in the galleries make visits more bearable for the whole family (and any hulking Godzillas who happen to be in the vicinity), but I agree that not everything needs to be turned into a cartoon character. And I love visiting what he calls “unmodernised museums: the museums that look like museums. I like them Victorian, cranky and encyclopedic,” (and so do my kids!) We promise not to swamp the place.